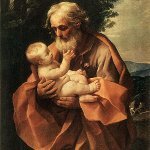 On March 19, Western Christians celebrate Saint Joseph’s Day. This feast day commemorates Saint Joseph, the husband of the Virgin Mary and legal father of Jesus Christ. The Feast of Saint Joseph is a public or regional holiday in a number of countries. In some cultures, it is celebrated as Father’s Day. The Gospel of Mark makes no reference to Joseph. The first appearance of Jesus’ father is in the gospels of Matthew and Luke. Each of the two gospels provides a genealogy of Jesus showing that Joseph is descendant from King David, but through different sons (Solomon in the Gospel of Matthew and Nathan in the Gospel of Luke). Joseph’s occupation is generally translated into English as “carpenter”, although the Ancient Greek word tekton used to describe him is a common term for artisan or craftsman. The miraculous conception of Jesus Christ occurred when Mary was already betrothed to Joseph. At first, he wanted to quietly divorce her, but an angel told Joseph in a dream that Mary’s conception was by the Holy Spirit. After that, Joseph completed the wedding rites and traveled with his wife to Bethlehem, where Jesus was born. Joseph loved and raised Jesus as his own son, so Jesus is sometimes referred to as “the carpenter’s son”. The last time Joseph is mentioned in the Gospels is when Jesus is 12 years old; he is assumed to have died some time before Jesus’ adult ministry. Saint Joseph is regarded as the patron saint of workers as well as fathers, pregnant women, unborn children, families, immigrants, travelers, pilgrims and explorers. In addition, he is the patron saint of many cities and countries, including the Americas, Austria, Belgium, Canada, China, Croatia, Indonesia, Mexico, Korea, Peru, the Philippines, Poland, and Vietnam. In some of these countries, his feast day is a public or regional holiday. The principal feast day of Saint Joseph has been observed on March 19 since at least the 10th century. In the Catholic Church, it has a rank of a solemnity, the highest rank in the hierarchy of feast days. In addition, there’s the Feast of Saint Joseph the Worker celebrated on May 1 to coincide with International Worker’s Day. Saint Joseph’s Day usually falls during Lent, when devout Christians abstain from eating meat, so it is customary to serve meatless dishes on the occasion. If it falls on a Sunday or during Holy Week, the observance is usually moved to another day. In some countries, the Feast of Saint Joseph coincides with Father’s Day. They include Croatia, Italy, Spain, and other countries of Catholic Europe. In certain countries and regions, there are special traditions associated with Saint Joseph’s Day. In Italy (especially Sicily), for example, people assemble home alters dedicated to Saint Joseph. Upon such an altar, they place candles, flowers, wine, blessed fava beans, and food (bread, cakes, cookies and zeppole, a type of deep-friend pastry). A similar custom exists in Poland. At some point, the tradition of Saint Joseph’s Day altars was brought to the United States by Italian immigrants. In Malta, Saint Joseph’s Day is a public holiday. It is marked with special masses, colorful processions, and firework displays. In the Spanish city of Valencia, the day is marked with a traditional celebration called the Falles (las Fallas de Valencia).